Author and child advocate Peter Thomas Senese and the I CARE Foundation are working hard toward creating several new federal legislative policy initiatives that may dramatically reduce the surging number of international child abductions occurring each year from the United States. As part of the author and I CARE Foundation Director's efforts to educate members of Congress, and based upon feedback from national policymakers, Peter Thomas Senese, in conjunction with Pacifica TWST and the I CARE Foundation will distribute review copies of the critically acclaimed novel 'Chasing The Cyclone' that was inspired by the author's own experience. Chasing The Cyclone author Peter Thomas Senese announced today plans to distribute copies of his critically acclaimed legal thriller on international child abduction to members of Congress and members of key government agencies to coincide with the I CARE Foundation's efforts to educate and mobilize policymakers in order to pass new legislative initiatives that will protect children from international abduction. Senese commented, "The I CARE Foundation has been working on creating new federal legislative policies that may dramatically reduce the number of international child abductions our nation faces. Presently, if the trend of abduction continues, there will be as many as 100,000 children criminally international stolen. This is absurd. However, if we are able to modify the Western Hemisphere Travel Initiative policy while also creating a unilateral security screening list for high-risk abductors similar to the Prevent Departure Program, while of course, continuing our efforts to educate the judiciary, then we will substantially lower the child abduction rate. Education of policymakers is key. Recently, I have distributed review copies of Chasing The Cyclone to certain members of Congress and other administrators charged with oversight of key government agencies in order to give them opportunity to understand what it is like to chase the cyclone of abduction. To my surprise, numerous additional requests for review copies have occurred. So, the I CARE Foundation is going to distribute several review copies to each member of Congress in hope that perhaps they, like other members of Congress, will read Chasing The Cyclone and understand the size and scope of the problem facing our nation's children. Fortunately, even members of Congress read - and with various book critics sharing generous commentary about Chasing The Cyclone, members of Congress are in fact picking up the book exclusively through Amazon for their Kindle or requesting advanced review copies, reading, and educating themselves. It is a very big step." CHASING THE CYCLONE, Peter Thomas Senese's recently released novel available on E-book that will be released next month in hardcover that critics and parents are praising as a spectacular call-to-arms against international child abduction and a gripping legal thriller that raises the bar on society's understanding of this devastating epidemic, and an absolute must-read for the growing number of parents at risk of having their child abducted overseas by the other parent: a phenomenon that will targeted millions of North American citizens over the next decade. Pacifica TWST and Mr. Senese have announced that 'Chasing The Cyclone' will be released in Spanish, Italian, and French on the late Spring of 2012l. Amazon Hall of Fame book reviewer Daniel Jolley commented, "Chasing The Cyclone" isn't just a powerful novel; it's a call to arms against a growing epidemic that is tearing lives apart behind the headlines... 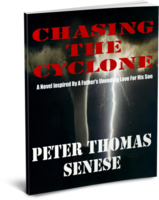 I would go so far as to encourage every loving parent to read this book, as the bond between this father and son is one to be emulated..."
Dr. Grady Harp, a highly respected Amazon Hall Of Fame book reviewer said, "Peter Thomas Senese now opens the windows on the magnitude of these tragedies in his excellent "Chasing The Cyclone"... Senese demonstrates his quality as a writer of distinction on many levels... this impossible to put down book..."